Posted on 14, October 2016 by EuropaWire PR Editors | This entry was posted in Construction, Education, United Kingdom and tagged Ian Mason Mary Courtney, Lawrence Young University of Warwick, teaching and learning facility. Bookmark the permalink. Coventry, UK, 14-Oct-2016 — /EuropaWire/ — A multi-million pound brand new teaching and learning facility at the University of Warwick opens to staff and students on Monday 17 October. 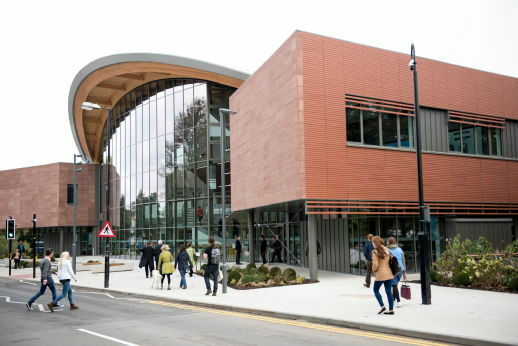 The £19m flagship Teaching and Learning Building boasts two large, state-of-the-art lecture theatres and 14 top quality flexible teaching spaces. In addition to the latest technology to assist with teaching the building boasts a state of the art four-screen video wall in the central atrium. Constructed in a key position on central campus, it is the first building on campus dedicated completely to teaching and learning in all disciplines and no one department or service owns the building. One of the lecture theatres will be the largest on campus with 500 seats, and boasts a spectacular glass and timber roof with a huge range of charging point facilities for laptops and other devices. Of the 4 teaching rooms on the ground floor, 3 open out into the freshly landscaped area outside the building, providing a unique experience for those studying. The building was designed by Berman Guedes Stretton who have received many architectural awards for their higher education projects, who worked with project planners Pick Everard and contractors Willmott Dixon to deliver the stunning landmark building. In the central atrium is a four-screen video wall which will host a range of art displays, timetables of upcoming activity in the building and live-streams of lectures and other events in the main lecture theatres. There are high-tech features elsewhere in the building, with electronic screens outside each room showing availability and interactive digital boards to help with wayfinding. Mary Courtney, artist in residence at the University has been working closely with Professor Patrick Unwin from the Warwick Chemistry department and other chemists to collate and create chemistry-art or ‘chem-art’. The art features corroding metals, prescription drugs and brain scans at a microscopic level. Working with technical advisor Ian Mason from the University’s Audio Visual team they have presented research in a way that is both visually appealing and thought provoking in the buildings central atrium. Using the latest in display technology this interdisciplinary collaboration brings the often unseen beauty of the microscopic world to life. For this project, the video wall acts as a window on research and is a collaboration between science, art and technology which showcases creativity in chemistry using a digital medium in a modern and accessible way. Students and academics of all disciplines using the new cutting edge building can view and enjoy the display. The new Teaching and Learning Building sets the benchmark for future campus developments. In addition to the continual ongoing work to enhance facilities around campus future projects include a £40 million project to create new state of the art sport and wellness facilities by October 2018 as part of the university’s approach to creating an active campus community.